Hyderabad: Hyderabad earned the epithet of the bulk drugs capital of India for the role it played in the growth story of the country’s pharmaceutical industry. The city now accounts for about one-third of India’s total bulk drug production, or the chemicals that go into making a drug. Availability of trained manpower, especially in chemistry and active pharmaceutical ingredients manufacturing, good ecosystem of talent, infrastructure, funding agencies and public infrastructure are chiefly the reasons behind Hyderabad’s dominance in the pharmaceutical sector. The city is also among the favourite destinations of information technology (IT) firms. Andhra Pradesh, of which Hyderabad is the capital, has the fourth largest IT sector in the country, largely due to government sops, infrastructure facilities and availability of a large talent pool graduating from its record number of engineering colleges. It is not surprising, then, that the state attracted investments worth Rs25,173 crore in 2006-07, second only to Gujarat and surpassing Maharashtra and Tamil Nadu, according to a August report by the Reserve Bank of India (RBI). “Andhra Pradesh has vast opportunities to attract additional investments of Rs10 lakh crore by 2012," says Associated Chambers of Commerce and Industry of India, or Assocham. There have already been investment announcements of Rs1.06 trillion for the state in the first half of 2008, the industry body said in a report released last month. “Andhra Pradesh is the best investment destination in the country," says K.V. Kamath, president of the Confederation of Indian Industry, or CII, who is also chief executive and managing director of the country’s largest private sector bank, ICICI Bank Ltd. The industry, however, feels that the state is not fully utilizing its potential. The state government does not see the pharmaceutical industry as a generator of major employment, unlike IT, says G.V. Prasad, vice-chairman and CEO of Dr Reddy’s Laboratories, India’s second largest pharma company by revenue. Prasad says the cost of setting up infrastructure is a major deterrent, and the lack of support from the administration and its inability to solve issues arising out of archaic legislation, such as land ceiling Acts, are a threat to the industry. Andhra Pradesh needs to take advantage of the opportunities that the pharmaceutical industry offers to the growth of its economy and development through setting up of industrial corridors, industrial parks and special economic zones with good hard and soft infrastructure, he adds. In its biannual industry survey from October 2007 to March 2008, CII’s southern region has expressed concern for the state’s pharma industry. “Poor quality and irregularity of power, besides inadequate supply of diesel to run power generators, affect the industry’s performance. The delay in processing of duty drawback claims is concerning especially small manufacturers," CII said. The IT sector in the state, though, is largely content with the government policies and the pace of development in Hyderabad. “The region has many premier engineering institutes and management schools which assures IT companies of the availability of a sizeable talent pool. The city is also developing at a fast pace. The physical infrastructure available in Hyderabad is much superior to that of other IT happening cities in India," says G. Jayaraman, global head of corporate governance at Satyam Computer Services Ltd, the country’s fourth largest software exporter. Global IT players such as Microsoft Corp., General Electric Co., International Business Machines Corp. (IBM), Google Inc. and Oracle Corp. have all established presence in Hyderabad. Besides, the top four Indian IT services firms—Tata Consultancy Services Ltd, Infosys Technologies Ltd, Satyam Computer Services and Wipro Ltd—have significant operations in Hyderabad or other parts of Andhra Pradesh. According to a study by industry lobby group National Association of Software and Services Companies (Nasscom), 23% of India’s software professionals are from Andhra Pradesh. 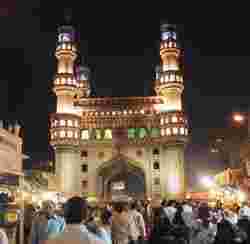 “Hyderabad and its surroundings are gearing up for growth faster than ever. From better roads, infrastructure, facilities to growth opportunities and social development, the face of the city has changed completely and rapidly in the last few years", says Jayaraman. At the same time, he says that if the government intends to attract more investors into the state and Hyderabad, it should “plan for single-window clearance for all statutory approvals, better transportation facilities, affordable rents for real estate, residential developments closer to IT campuses and uninterrupted power supply to IT campuses." CII, which has been working closely with the state government, is of the view that despite record number of academic institutions, including engineering and medical colleges, Andhra Pradesh still lags in skills development that enables employment growth. “Development in this area in the post reform period has been lagging behind and more work is needed," says Utpal Sen Gupta, chairman of CII’s Andhra Pradesh chapter and president of Agro Tech Foods Ltd. The state also needs to ensure that adverse effects of global economic turmoil are minimized. “Investments by the government and private sector through more public-private partnerships will be the right step at this juncture, " Sen Gupta says. Another key threat to the growth of the state’s industrial economy is from terrorism where rising cities such as Hyderabad are being increasingly targeted. “There is need for proactive action by the government as well as civil society to address this threat," Sen Gupta says.